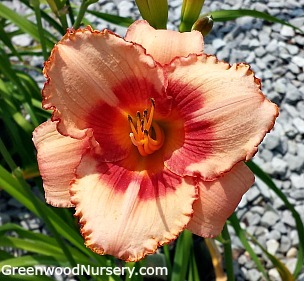 Daylily Hemerocallis Strawberry Candy will rebloom throughout the summer. The apricot to pink flowers pop with their deeper strawberry shaded eye. The long green foliage is semi-evergreen in warmer climates. Strawberry Candy Daylily is good for garden borders, coastal landscapes, container gardens and a good blend with herb gardens. Strawberry Candy matures up to 18 to 20 inches tall and spreads up to 24 inches wide.